That's the answer to the question I asked a lady recently. The question? It was "Why did you say you won't go to Heaven?" I was meeting with her to to talk about joining Midtowne Church. As I do with everyone I meet with who is interested in joining our church, I asked her if she thought she would go to Heaven. She was very matter of fact and said, "No." I was a bit caught off guard by her candor and then asked the follow up question. Here's where it gets good. I asked if she knew what it took to get to Heaven. With the same matter-of-fact tone and expression, her reply was basically this. She said she knew she had to turn her life around and give Jesus control of it. She said that she believed that Jesus died on the cross for her sin and that He is the only way to be forgiven and the only way to Heaven. I was very surprised. Not by her answer, because she was right. But I was surprised that, even though she knew how to get to Heaven, she had not done what it takes to get there. Since I am the type that likes to get right to the point, I asked, "What are you waiting for?" Her answer: "I'm ready." It was amazing to share this experience with her. I prayed with her in my office and she gave her life to Jesus. So What? It just really doesn't matter what you have done. Jesus died for you and He can and will forgive you and give you eternal life in Heaven and a fulfilling life on Earth. Also, just knowing what to do is not enough. You must take action. If you have never asked Jesus to come in to your life, why not do it right now? A simple prayer of faith saying that you believe He died on the cross for your sin and came back to life so that you can have eternal life and a meaningful life on Earth is all it takes. But that's not the end. I am looking forward to baptizing that lady soon and helping her grow in her relationship with God and I would love to do the same for you. If you need to ask Jesus into your life, send me an email and let me know how I can help you. That's the only word I can think of to describe what happened yesterday at First Baptist Church in Maryville, Ill. A Pastor, doing what he loved to do, what he was called to do, gunned down for no apparent reason. Time will tell if there is any connection with the gunman, but for now it just appears to be a tragic, senseless crime. It's a sad day for all of us. When people cannot go to a place that they consider safe and express their love for God and others and learn how to share that love with others, it's a sad day. That's really what we want, isn't it? We want to go to church and show love, express love, learn to love, and be equipped to love. With all that love going around, how could something so tragic happen? We may never know the motive behind this shooting. We certainly will never understand what was in the gunman's head. But one thing is for sure: God knows. God says in Jeremiah 29:11 (NLT), "For I know the plans I have for you,” says the Lord. “They are plans for good and not for disaster, to give you a future and a hope." You may have heard this verse before, but I want you to look at the second and third words again, "I know". God knows. Period. That's all that really matters. We don't have to understand. We don't have to feel badly for our ignorance. God knows. We can find peace and comfort in those words. We can continue the mission He has given us in that promise. He knows. So What? Don't allow this tragic event to keep you away from God or His Church. If you attend a church, continue to go and support the ministries it provides. If you don't, find one, begin to attend and get involved. Events like this will either push us closer together and to God or will drive us further away. Only you can decide what it does to you. God knows. Pray for First Baptist Church in Maryville. Pray for the Pastor's family. 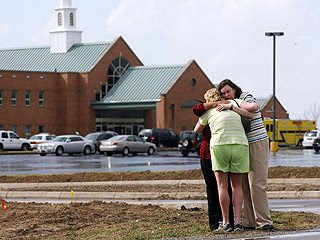 Pray for the church members who were injured. And don't forget to pray for the gunman and his family too. They are facing a tough time as well. I met a friend of mine for coffee this week. He and I have not hung out for a long time so it was really cool to catch up on all that is going on in his life. And man, there is a lot going on in his life! He is about 10 years older than me and a lot of fun to be around. He is a self described "questioner." He loves to ask questions. He questions everything, even himself. Not in a bad way, but in a genuine, considering, learning kind of way. He has always challenged me in many ways and has helped me get out of my comfort zone and think hard about my life and ministry. He is also a learner. He loves to read and study. He studies a lot. He is always searching, investigating, learning, and discovering. Something he said while we sipped our coffee really stuck with me. He told me that as he has studied the Bible something interesting and unexpected has happened. While the goal of his study was to gain insight so he could teach others, he instead discovered God in an entirely new way. In his attempt to gain information and share it with others, he fell deeper in love with God. His entire outlook on God, ministry, and life has changed. He sees God in a deeper, more intimate way and it has changed the way he lives. He has, in his own words, gone from being self seeking to a committed servant of others. His relationship with his family, coworkers, friends, and even strangers has taken a major turn. As he told me all about what is happening in his life, I literally got goose bumps. I caught myself with a silly grin on my face and almost giggling. I reached over and touched his arm, looked him in the eye and said, "I am so excited for you! I can't wait to see how God leads you and where He takes you in this new adventure in your life!" So What? Our walk with God is not about how much information we take in. It is all about how much deeper in love with God we become. When we truly fall deeply in love with Him, our outlook on life changes in dramatic fashion. We no longer think only of ourselves and how we can benefit from our knowledge of God, we begin to look at others and become interested in them. We desire that they truly enjoy the life God has for them and we seek ways to empower them to enjoy that life. We want what's best for others.